Peninsula Pelješac is an inexhaustible source of adventure. The sea, stone and uncultivable terrain created unique landscapes, inspired artists and thrilled many travelers. Orebić, the tourist center of the peninsula, is known for its sea captains. There hardly is a home in town that did not produce at least one skilled sailor. 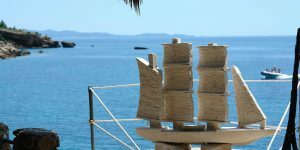 The stone sailboats serve as testimonies of the authentic beauty and rich traditions of Orebić and Pelješac. The artist behind them is your host, Igor Mikulić. Ever since he discovered his talent and passion for stone carving, he began dedicating every spare moment to his artistic expression. This resulted in a bountiful collection of exhibits that found their place right on the seafront at Kamp Adriatic Orebić. The stone sailboats blended nicely with nature, as if they’ve always been there. If you are on a land route to Pelješac, you first go through the fortified, medieval town of Ston. Its five and a half miles of long 14th-century defensive walls will impress you. They were built to protect Ston’s exceptionally valuable salt works, that have not changed their appearance or way of production until today. Believe it or not – these defensive walls are the longest, and the salt works the oldest of its kind in Europe. What a good reason to visit Ston! When you are there, you must stop and relax in one of Ston’s charming restaurants and definitely try the local oysters, a famous delicacy of the crystal clear Mali Ston Bay. Make sure you don’t leave without visiting the Lapidarium, the outer collection of the Dubrovnik Archaeological Museum, located on the ground floor of the parish hall. On the western side of Pelješac, the view of the beautiful South Dalmatian islands is spectacular. If you are in Orebić, the island of Korčula is right in front of you. A fifteen -minute ferry ride is all it takes to visit this beauty. If you visit this city (and island) you will not regret it! In Korčula, surrounded by medieval fortified walls, is the house of world-renowned explorer Marco Polo. Take a look at the Gothic-Renaissance style St. Mark’s Cathedral, the City Hall and the 15th century Franciscan monastery on the island of Badija. You should not leave Korčula without trying pošip – an autochtonous wine variety, which owes its quality to the extremely favorable grape-growing conditions on this island. Only 45 minutes by ferry from the Pelješac town of Prapratno keeps you from Mljet – one of the most beautiful islands you have ever seen! Legend has it that Mljet is actually Homer’s Ogygia, the beautiful island of the Nymph Calypso, where she detained Odysseus for seven years. 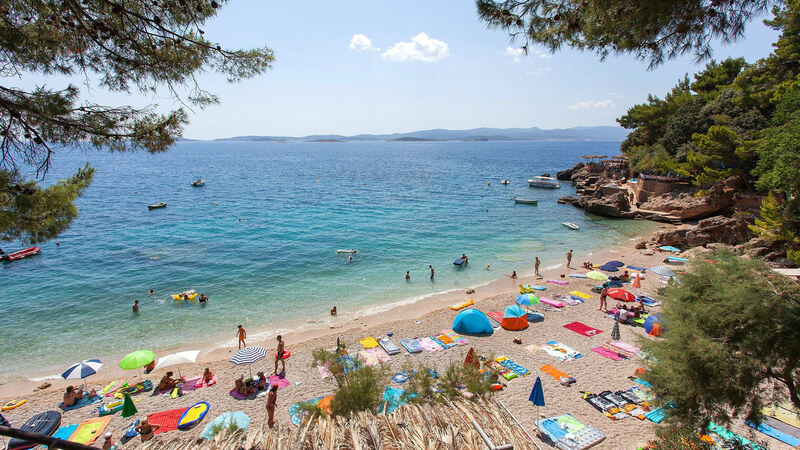 The northwestern part of the island is a National park known for its salt-water Veliko and Malo Jezero (Big and Small Lake), its picturesque villages, beautiful coves and beaches – of which the most beautiful beach in Polače, a cove protected by numerous islets. It is considered one of the most beautiful cities in the world, and for a good reason! Medieval Dubrovnik, a city under the protection of UNESCO, magically attracts tourists and filmmakers from all over the world. Its cobblestone streets make ideal backdrops for world class film productions, among which are the planetary popular series of Game of Thrones and the Star Wars franchise. You will be thrilled with the city walls with fortresses, magnificent Stradun, many charming restaurants and bars. Dubrovnik is the ideal choice for a day trip! Orebić is only about eighty kilometers, or one hour’s drive away.